Gazprom has expressed interest in using the Trans Adriatic Pipeline (TAP) to link the second line of the TurkStream gas pipeline because TAP’s route is already established, John Roberts, a senior fellow at Atlantic Council’s Global Energy Center told Anadolu Agency on Wednesday. Speaking exclusively to Anadolu Agency, Roberts hailed the TurkStream pipeline as a project that will improve Turkey’s energy security because it allows greater flexibility for gas transit to the country. The TurkStream pipeline is an export gas pipeline stretching across the Black Sea from Russia to Turkey and further to Turkey’s border with neighboring countries. One line is expected to supply the Turkish market, while a second line will carry gas to southern and southeastern Europe. Each line will have the throughput capacity of 15.75 billion cubic meters of gas per year. Gazprom on Sunday announced that the construction of the offshore section of the TurkStream gas pipeline project commenced in the Black Sea near the Russian coast. “It [TurkStream] does not really change the balance of gas coming to Turkey. One of the big elements in changing that will be the completion of the expansion of the Baku-Tbilisi-Erzurum system and the development of the TANAP pipeline,” he said. 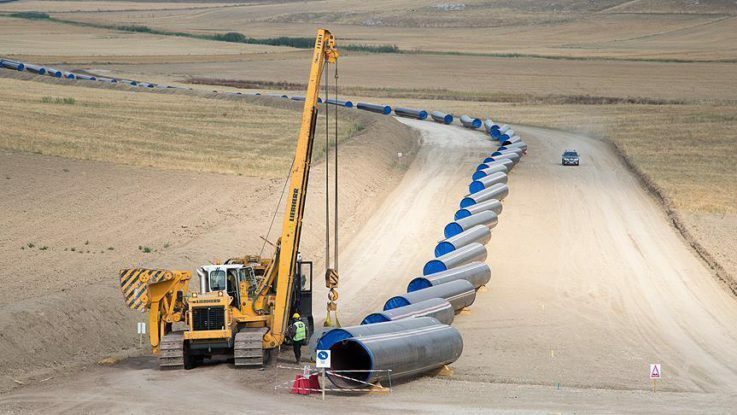 The approximately 878 kilometers-long TAP pipeline will connect with the Trans Anatolian Pipeline (TANAP) at the Turkish-Greek border at Kipoi, cross Greece and Albania and the Adriatic Sea, before coming ashore in southern Italy. Roberts affirmed that the EU does not have any role in the construction of the second line of the TurkStream project, which plans to reach EU markets through Turkey because its construction is outside the EU. “Where the EU comes into the picture is with the termination of the second line on the Turkish border with Greece at Ipsala in Turkey which is opposite Kipoi in Greece. At that point, the question is what happens to the gas in that line? The Russians have said that they would like to supply it to the European Union and, in some cases, this will go to customers already served by Ukraine,” he explained. Roberts argued that the under-construction TAP pipeline, which travels from Kipoi all the way through southern Italy, is key for the delivery of extra capacity. “That pipeline is designed to have an initial capacity of 10 billion cubic meters (bcm) which has already been booked by Azerbaijan. But it will have an additional capacity of 10 bcm. Now that capacity under EU regulations is available for whoever wants to book it on the best commercial terms. As of around 2019-2020, whenever TAP is opened up for business, the only supplier that we can see on the horizon capable of delivering anything like an extra 10 bcm is Gazprom through the second line of TurkStream,” Roberts said. “There is no theoretical or legal objection to Gazprom asking for what is called an open season in which the TAP pipeline authorities have to allow it to compete. And since we would not expect anybody else to compete, we would expect a deal,” he explained. However, Roberts argued that Gazprom would have to give about two years notice of its plans to pump gas into a pipeline because although the physical pipe is there to carry the gas, extra compression is needed to push the extra gas through. TAP would have to put in place the extra compression, which would cost billions of euros for all involved, according to Roberts. “It is not a small thing. So my guess is that Gazprom, which already signaled its interest in using TAP, will use TAP because of its route. If they do not, somebody has to come with 5 or 6 billion dollars or euros to build an entirely new pipeline,” he concluded.